A man is seen beaten and on the ground after he was attacked by a suspect in downtown Los Angeles on Saturday, April 3, 2016. 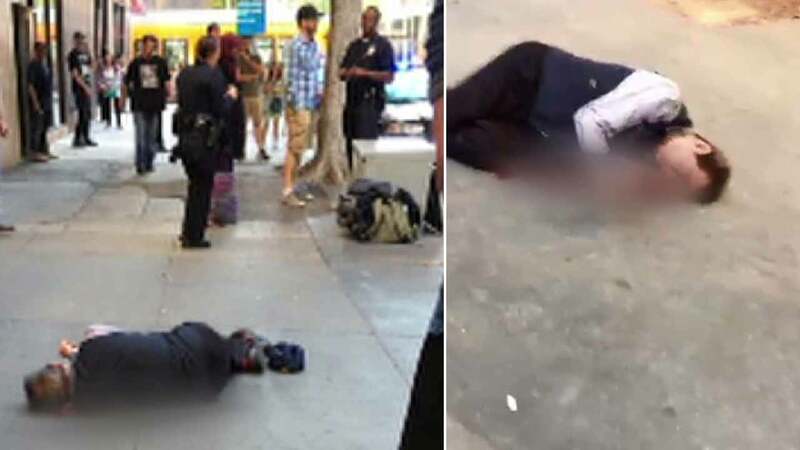 LOS ANGELES -- An elderly man who was brutally beaten in broad daylight in downtown Los Angeles earlier in April has died, according to Los Angeles police. Police said 85-year-old Dong Yul Lee was attacked near a Whole Foods on 7th and Olive streets at about 3:40 p.m. on April 3. LaFawn Parker, a 46-year-old transient said to be mentally unstable, punched and kicked the elderly man several times as he was walking down the street, police said. Witnesses said Lee lived in the neighborhood. A security guard from the Whole Foods grocery store across the street witnessed the attack, pepper sprayed Parker and held him down until police arrived. Police confirmed to ABC7 that Lee died in the hospital on Monday. Parker had been previously charged with one count of attempted murder with charge enhancements for elder abuse.